← VeryPDF PDF Automation Server – Workflow PDF Server, Windows/Mac/Linux PDF Workflow, Cloud PDF Workflow, Automate PDF Generation, Conversion, Printing, Emailing, Storing, etc. operations. 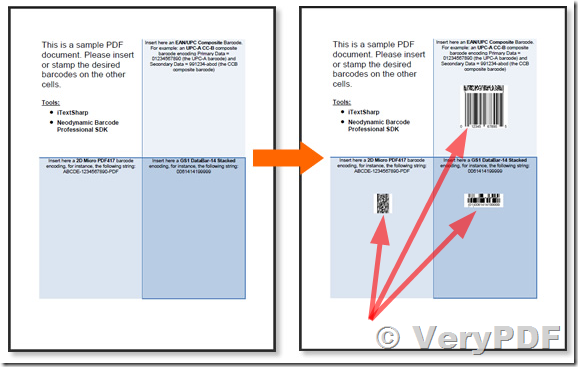 How to add barcode to PDF file in C#, VB.NET and VBScript with PDF Form Filler SDK and PDF Stamp SDK? I receive around 30 work orders a day from my primary client. They send them to me in a standardized report format, in a single PDF, with one page for each different work order. Unfortunately, these PDF reports don't include the work order_ID in a barcoded format, only in regular text font and they are unwilling to comply to my request to modify the report by adding a barcode. 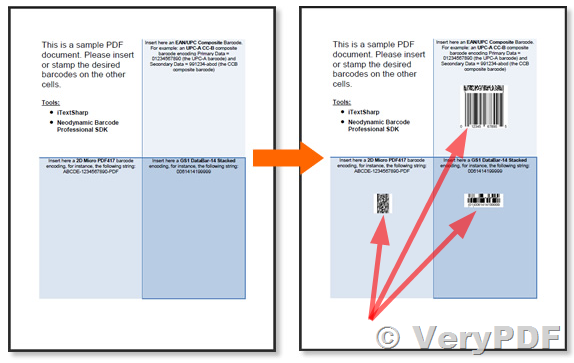 Is there a way to automatically add a barcode to the PDF? basically I would want the PDF editing app to search for the text "Work Oder ID:" and to insert the barcode, beneath the work_order ID. please advise. thanks very much. We can also generate 50+ type of barcodes dynamically, we will develop a Barcode Stamper SDK to best meet your requirement, if you are interest in this solution, please feel free to let us know, we will provide a quotation to you shortly. This entry was posted in VeryPDF SDK & COM and tagged barcode image, barcode pdf, barcode stamp, barcode text, pdf barcode. Bookmark the permalink.